Beverly was enjoying her "like new" old car that I had overhauled for her about a month earlier when my phone rang. It was Beverly saying that her car was sitting in a shopping center parking lot because it would not start. 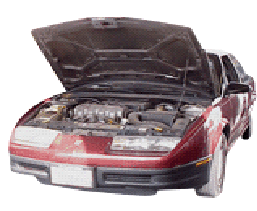 I thought, "There is no reason that car should not start it is in perfect running condition!" So I said I would get the key from her and go check it out. So about 9PM at night I went to the shopping center with a friend who would drive the car back when we got it fixed. As we pulled into the parking lot and spotted the car I was led by the Spirit not to pull up to the car, but to stay back several feet so I did. As I stopped my car my friend said, "Let's go! ", but I said "No wait a minute." I sat there in silence staring out my windshield, it was dark, I was tired and I said, "God, I don't want to stay here all night trying to fix this car. You know what is wrong with it, would you show me what's wrong?" Immediately before my eyes I saw a picture of my friend's car with the hood up. As I looked the picture zoomed in on the engine and continued to zoom in right to the coil in the engine showing me a close up of a wire. I turned to my friend who was waiting for me and said "God just showed me what is wrong with that car. I could sit here and tell you exactly what to do to fix it without even looking at it." I am not sure if he believed me or not. So we got out of my car walked over to the stalled car, opened the hood and there was a small wire next to the coil that had loosened and turned grounding itself out. I simply turned the wire about half a turn and crimped the connector with pliers to hold it into place. I knew that was all there was to it. I told my friend to start it up and let's take her car to her. He did, we did and that was that. I went home excited and amazed at what God had done for me. That was my first experience of receiving a vision from the Lord and it was so specific! I often wondered what the people in the Bible meant when they said they had a vision or trance, or they saw in the Spirit. Now I had a small taste of that and wondered if that was something that might happen only once in my life or could I expect to receive more things like that from the Lord. Now so many believers are discovering that God is sending dreams, visions, trances, and even appearing to people all over the world before His return. All the supernatural gifts and blessings of God are still in effect for He never changes. So don't be surprised at the things that God might do!